High Quality map available for download here. 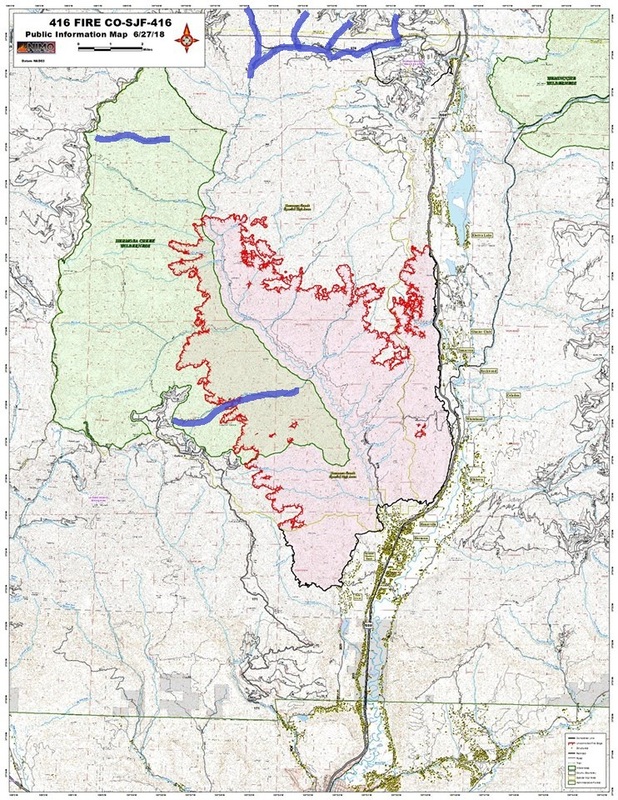 The 416 fire that started June 1, 2018 located 13 miles north of Durango, CO is currently over 35,000 acres large and is at 36% contained as of June 27, 2018 (seen in red outline & fill). Currently, the fire has encroached upon a large section of an isolated native cutthroat population along Clear Creek (traced with blue in the bottom left corner). You can see that most of that drainage has been hit. Clear Creek has been hit hard and currently burning more. The middle-left creek, Big Bend, also highlighted in blue is currently an isolated population of native cutthroats that are held safe from invasives by a natural waterfall. The other blue lines at the top of the map indicated where the reintroduction program waters are. The basin continues north along with the reintroduction program, but the map cuts off about 1/4 of that. The reintroduction program and Big Bend are clear of fire right now. It’s mostly burning back on itself with about 100 acres of additional acreage in recent days. There are two hot spots: 1) very near/at Clear Creek’s top end. 2) in the interior of Hermosa burning NW towards Big Bend. Currently, updates are being posted on the 416 Facebook page here.